The results below are what we strive to achieve with each and every one of our patients at Swift Audiology. It’s important for those experiencing hearing difficulties to realize that every person’s situation and hearing evaluation will be unique to them. 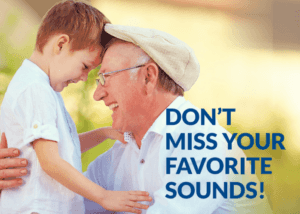 For that reason, one-size-fits-all type of hearing solutions or providers will not bring the most value to those struggling with the hearing loss. It really is all about patient-centered care. At Swift Audiology we work with each of our patients to determine the type and level of hearing loss, the level of lifestyle activity, consideration of budget and then work to find a solution that fulfills all those requirements. Following is a short testimonial of a recent patient that expressed before and after views on his hearing. Prior to working with Swift Audiology, I had a very difficult time hearing, especially out of my one ear. I lost hearing in my ear during the Vietnam War due to an infection, which resulted in unsuccessful treatment and an operation to remove two bones from my ear. My hearing has never been the same since. Hearing my wife, children, and grandchildren was very difficult. I would miss most of a conversation, if not all of it, because I was unable to make out the words that were being spoken. This was not only frustrating for me, but for my family as well. Since receiving the appropriate hearing screening and recommendations, my hearing has improved greatly. Swift Audiology worked with me to find me hearing aids that would best fit my needs and provide the best quality of sound. I am able to hear clearly and do not require people to repeat what is being said multiple times. It has made such a world of a difference to participate in a conversation, especially with my grandchildren. I am very pleased with the outcome that has been provided to me. I was treated with the utmost respect by all who were involved in my care. Everyone was very helpful and knowledgeable and I am beyond satisfied with the care I was provided. If you’re interested in having your hearing tested, click here to request an appointment with one of our hearing professionals. We staff doctor’s of audiologies and board certified hearing instrument specialist. Swift Audiology, a locally owned, family run practice was started by Debbie Swift over 30 years ago. Located in four easy locations across Greater Pittsburgh, we are here to help you hear better.